2018’s Honorees Noreen Frieling, Midge Swickard, Suzanne Peery. 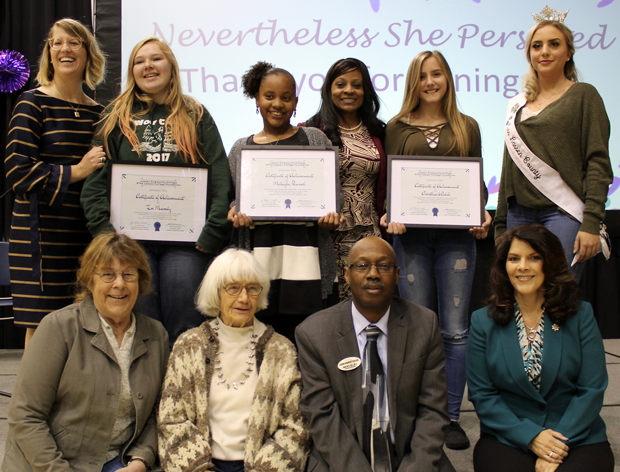 Not pictured, Susan Mouck, Theresa Nagel accompanied by Miss Lassen County Madisen Wallace, LCOE contest winners with LCC President Dr. Marlon Hall. 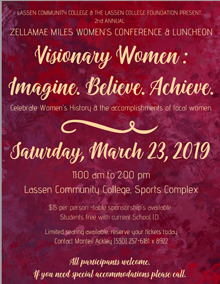 Lassen Community College and the Lassen College Foundation are presenting their 2nd annual Zellamae Miles Women’s Conference, to celebrate women’s history and the accomplishments of local women, on March 23rd in the school’s sports complex. Cost to attend is $15 per person and there are table sponsorships available. Students get in free with a current school ID. Limited seating is available so reserve your tickets today by contacting Monteil Ackley at 257-6181 x8922. All participants are welcome and if you need special accommodations please call.